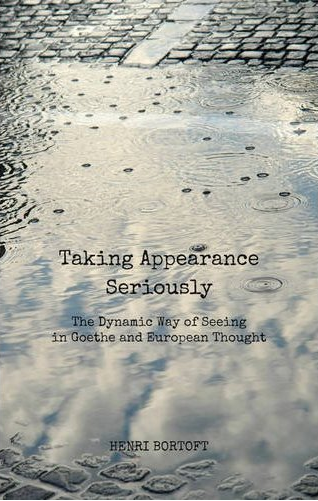 Having realised that the first chapter of Henri Bortoft’s new work Taking Appearance Seriously – The Dynamic Way of Seeing in Goethe and European Thought is available to read on line via Floris Books, I thought I would take this opportunity to explain why I think this chapter alone is well worth reading. This chapter is quite remarkable in that it introduces us to the major themes that would occupy Bortoft for the majority of his lifetime, and so I thought that I would summarise just part of the chapter here, while highlighting not only the book but some other interesting and related reading too. Henri began developing his critique of General Systems Theory in the 1970s, and in his first major book The Wholeness of Nature he devotes the first part to his conception of authentic and counterfeit wholes, which is a dynamic way of seeing the whole of a system. In Taking Appearance Seriously Henri provides the startling insight that in fact General Systems Theory, in attempting to provide a general mathematical science of systems, does in fact end up being remarkably similar to Descartes’ mathesis universalis it set out to replace. I tried to express the difference between this and the systems approach in a paper which I gave at a conference at the beginning of the 1970s. [EN4] What I wanted to do in this paper was to find a way of talking about wholeness that would avoid the ‘totalitarian’ tendency of systems theory – as a result of which the whole is reified and separated from the parts which it then dominates. The aim is to avoid reductionism without replacing it by holism. The hermeneutic circle gives us a different way of thinking, in which the parts depend upon the whole, but equally the whole depends on the parts. I found the language I was looking for in Heidegger’s notion of ‘presence’ (not to be confused with ‘present’), ‘presencing’, ‘coming-topresence’, and so on. This enabled me to say that the whole presences within the parts, which is intended to convey the sense that it is always implicit and can never become explicit as such – if it did it would become ‘present’ as an object (it would come ‘outside’) and hence separate from the parts. If the whole presences within the parts, then the only way to encounter the whole is within the parts through which it presences, and not by standing back from the parts to try and get an ‘overview’ of the whole. This leads Henri into a discussion about phenomenology, and in particularly that of Martin Heidegger, possibly the most important philosopher of the twentieth century. here we have to shift away from our focus on thinking about objects which are out there, independent of us in a physical reality, and move the centre of our attention away from what is seen, i.e. objects, and into the dynamic act of seeing. This does not seem so profound, to think about the act of seeing, but when we start to think in terms of systems, we no longer think of objects as boxes with hypothetical lines drawn between them, as we love to do in organisational theory, but we now have to think of the relationship between objects as the appear to us in our experience, our experience as human beings. The more dramatic conclusion from thinking dynamically is that it entirely overturns the previous two millennia’s obsession with dualism, a form of thinking that is perhaps now associated with the left hemisphere of our brains. In the 1980s Henri did not have much neurophysiology to back up his arguments, but in 2009 with the publication of Iain McGilchrist’s The Master and his Emissary which is a remarkable tour de force of our divided brains, there is now a huge amount of scientific research to back up what Henri and many other philosophers of phenomenology and hermeneutics have been trying to lead us towards understanding. The left hemisphere way of thinking and knowing the world has become so dominant, especially in western countries, that we have lost a very different way of understanding the world, complex systems, our environment and reality. Therefore to read and really understand and follow Henri’s movement of thinking is to move into a new way of knowing the world which is in balance, the left and right hemisphere of our brains working in harmony. It is for this reason that I lead people towards reading Henri, and to really work with his very meditative way of writing, which if read slowly, has been crafted very carefully to lead us into this dynamic way of thinking. This blog also gives me an opportunity to mention a new report written by Iain McGilchrist and Dr Jonathan Rowson, Director of RSA’s Social Brain Centre, Divided Brain, Divided World; Why the best part of us struggles to be heard. And finally I would like to mention that the March edition of the Holistic Science Journal will be entirely dedicated to the memory of Henri, who sadly passed away last December, shortly after Taking Appearance Seriously was published. The journal is an extremely important resource since practitioners of Holistic Science work with this dynamic and expanded way of knowing in many different areas, including the environment, biology, psychology, systems thinking, design, architecture, urban planning, change management, organisational thinking and education to name just a few. Subscriptions are available for both individuals and institutions.